In the summer of 1809, Britain and Spain had been allies against France for just over a year. Sir Arthur Wellesley was currently in the Iberian Peninsula with an army of about 30,000 men. Diplomatic relations with Spain, however, remained a little fraught – the two countries had been at war for much of the last decade, memories of Trafalgar were still fresh, and there was the little outstanding matter of Gibraltar, which made the prospect of any large body of British troops on Spanish soil a bit difficult. This the King refused, as it was his policy not to accept Orders from foreign governments (he felt it was improper for him to do so as the head of the Orders of his own kingdom). The Spanish, however, still wanted to make a statement of their gratitude for the way the Brits were helping them eject the French invaders from their country. They decided to think laterally, although they still kept to the fleecy theme. Their thoughtful gift was an unspecified number of very valuable Merino sheep, much prized (then as now) for the quality of their wool, and this George III did accept. “Other services” referred to the expedition to Walcheren, currently taking up all the spare time, ships, and transports belonging to the Admiralty, which was having a hard enough time making up the full complement of over 650 vessels for the campaign. The Spanish were undeterred. Would the King like some lovely Spanish horses instead? Canning duly passed on the King’s message to Cevallos; and there the matter rested. On 13 June 1809, as Canning reported to the King, Cevallos — who had clearly been instructed not to take no for an answer — tried again. Maybe not 4,000 sheep then: how about a smaller number? Apparently the Spanish insisted (“No, really, please — take our sheep”). One imagines the corridors and State Rooms at the Queen’s House full of roaming sheep, chewing on the furniture and making a tremendous mess. This was a mistake, as the Spanish seem to have interpreted it rather more broadly than the King presumably intended. It’s possible they genuinely couldn’t believe George didn’t actually want any more sheep. So they decided he was just being polite, and sent them anyway. On 18 July 1809, as the preparations for Walcheren were really hotting up, a large, smelly, and very noisy package arrived in Portsmouth. I don’t suppose he found it very funny. Postscript: what happened to the sheep? I can’t be sure, although there was a letter from September 1809 referring to Spanish shepherds being placed under the control of a page in the Royal Household at the Queen’s House, so presumably some of them ended up in Green Park. Aspinall suggests the rest of the sheep were distributed among the King’s courtiers. Canning himself didn’t get away without some (after initially declining them, but apparently his wife liked fluffy woolly ceatures more than he did, so he asked for a small flock of 50). Arthur Aspinall (ed. ), The Later Correspondence of George III, vol. 5 (Cambridge: University Press, 1970), pp. 214-5. British Library Canning MSS, Add MS 89143/1/6/6, 2 June 1809. 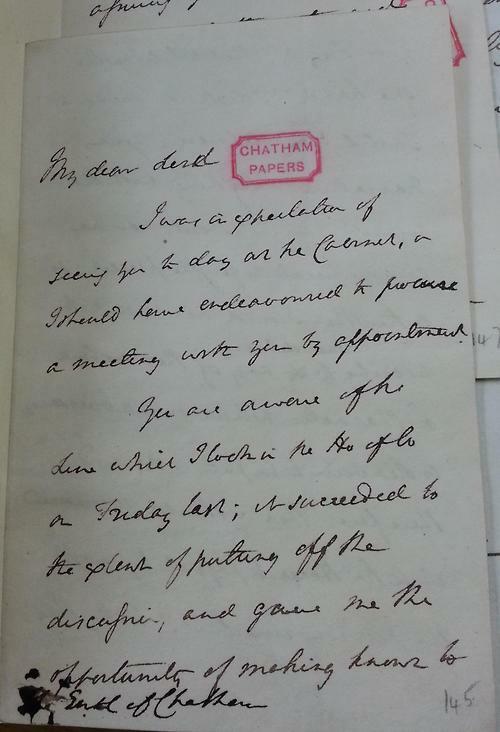 The correspondence is also printed in Aspinall. British Library Canning MSS, Add MS 89143/1/6/6, 3 June 1809. British Library Canning MSS, Add MS 89143/1/6/6, 13 June 1809. British Library Canning MSS, Add MS 89143/1/6/6, 14 June 1809. 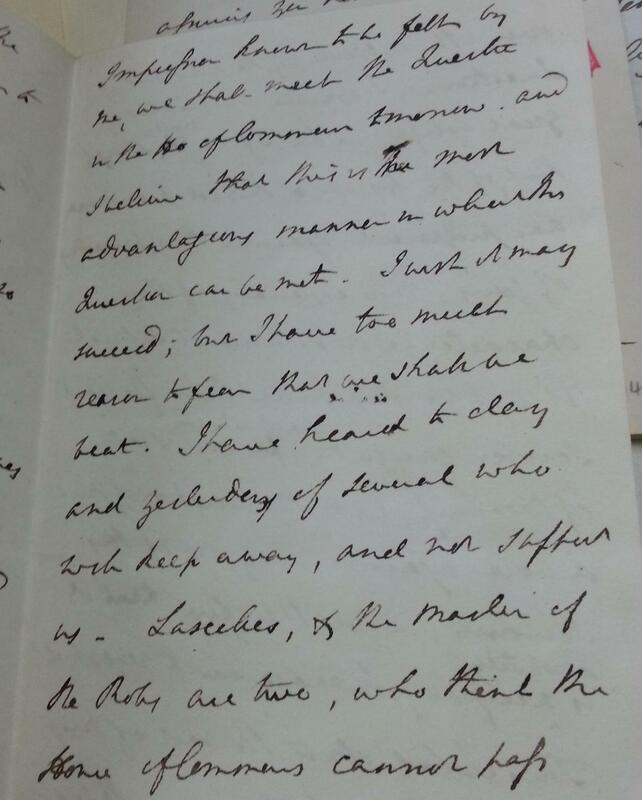 British Library Canning MSS, Add MS 89143/1/6/6, 18 July 1809. British Library Canning MSS, Add MS 89143/1/6/6, 19 July 1809. 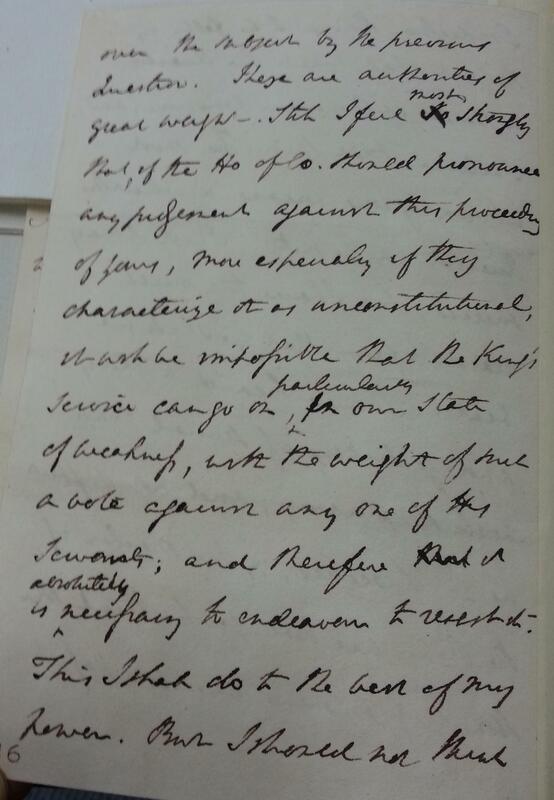 British Library Canning MSS, Add MS 89143/1/6/6, Colonel Taylor to Canning, 19 July 1809. Aspinall, Later Correspondence, vol. 5, p. 315 n. 1. In mid-May 1809, the British government was pretty sure it was going to be sending a sizeable expedition to the Scheldt basin to reduce the island of Walcheren and destroy the dockyards of Antwerp. Horseguards was busily preparing a force of thirty thousand men (the number would later rise to nearly 40,000); the Admiralty was putting together a flotilla of over six hundred vessels, from the 80-gun HMS Caesar to a vast fleet of transports and flatboats. At this point, however, the military and naval commanders had not yet been appointed. 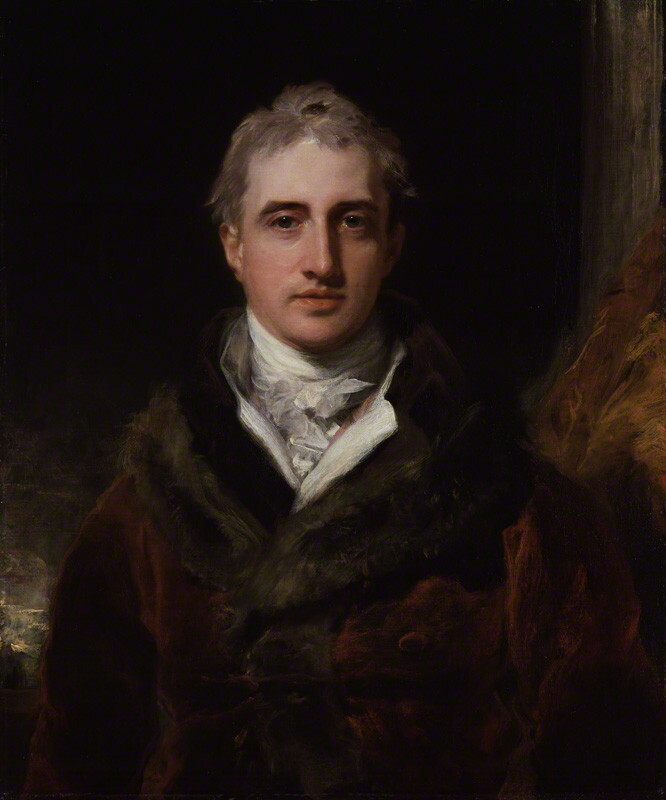 Lord Castlereagh, the Secretary of State for War, had been thinking about an expedition to the Scheldt for months. When he had first considered it, he had intended the command to go to Sir John Moore, but Moore had been killed at Coruña in January. 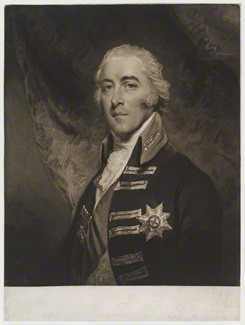 For a while there was a rumour that Sir John Hope would take the command, as he was one of the more senior generals attached to the expedition, and there were other rumours that Sir Harry Burrard and even the Duke of York were considered, In fact the job went to John Pitt, 2nd Earl of Chatham, then a cabinet member as Master-General of the Ordnance. Why Chatham was chosen mystified contemporaries, and historians since. Chatham had joined the army in 1773, but, although a reasonably senior Lieutenant-General by 1809, had not served abroad since 1799. He had in fact not been militarily active at all between 1784 and 1798. There were the usual conspiracy theories – the King had nominated him; George Canning wanted Chatham to succeed so he could prop him up as a figurehead Prime Minister; Chatham needed the cash – and of course after the whole deal went wrong everyone at Horseguards and the War Office was busily accusing everyone else for the appointment. I am anxious to have the great Question on which we conversed yesterday put in a course of proper Investigation. The Admiralty are naturally pressing upon it, and Commodore Owen is come to Town for the purpose of giving his Assistance. 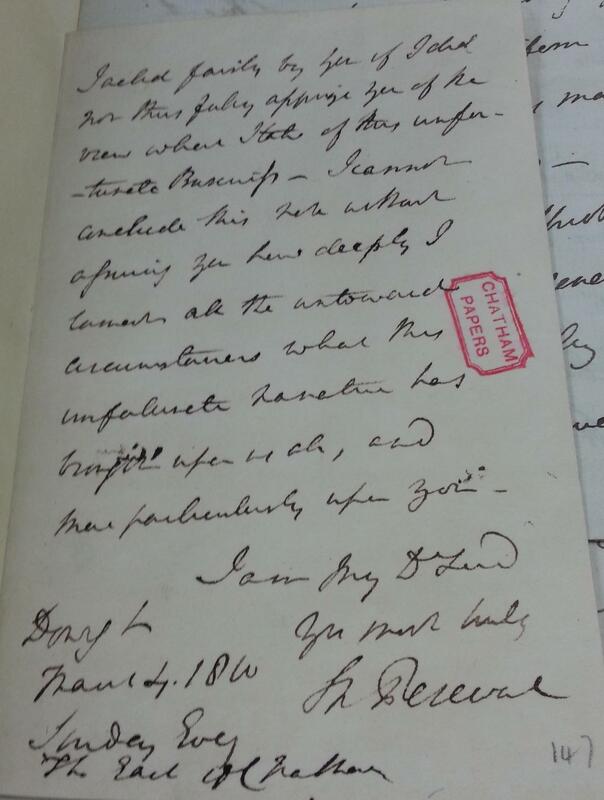 I do not conceive, that any Effectual progress can be made, till we have come to a decision, Who is to be Entrusted with the Execution of the Operation, if it should be determin’d on, nor indeed till this is fixed, can any of the Departamental [sic] Arrangements be satisfactorily proceded [sic] on. Under these Impressions, and in the hope that the result may prove as honorable to the Commander, as advantageous to the Country, allow me to propose it for your acceptance. In Expressing my own wishes, that it may be confided to you, I am authorized to add the Duke of Portland’s, and I have no doubt those of all our Colleagues. Until I am possess’d of your Sentiments, I shall not feel myself authoriz’d to mention the Subject to His Majesty, nor indeed can I well take any measures at the Horseguards in furtherance of our purpose. I received your letter of this morning, and feel sensibly the kind manner, in which you have proposed to me, the command of the Expedition, now under consideration, and I am much gratified by the concurrence in your sentiments, expressed by the Duke of Portland. Of course, I shou’d be at all times, ready when called upon to obey His Majesty’s Commands, but considering this proposal, as an Option given to me, confidentially on your part, I can only say, that I shou’d be very anxious to have some further conversation with you on this subject, before I venture to give any decided answer to it. I am better, but still confined. I shou’d therefore be happy if you wou’d have the goodness to call here at any time most convenient to you. Perhaps Chatham already had a premonition of what was to come. If so, I imagine both he and Castlereagh had reason to rue the day he overcame his reluctance and accepted the command of the Walcheren expedition. I’m guessing the moment John read this letter was the moment he saw the end of his 22-year cabinet career rushing towards him at great speed. 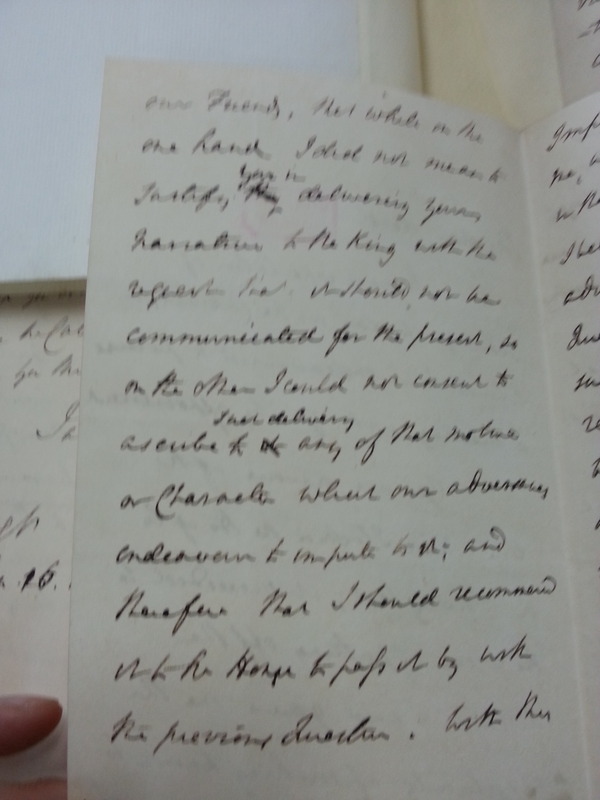 This letter was written by the prime minister, Spencer Perceval during the enquiries in Parliament in early 1810 over the failure of the expedition to Walcheren, which Lord Chatham commanded. Perhaps the most embarrassing detail for Perceval’s government was the fact that Chatham submitted a memorandum of defence to the King, privately, on 15 October 1809 after returning from campaign. He later resubmitted the memorandum in accordance with protocol to the King via the Privy Council, on 15 February 1810, but it was too late. The opposition, led by Sir Samuel Whitbread, accused Chatham and, through him, the government of unconstitutional behaviour. Chatham was Master General of the Ordnance with a seat in the cabinet at the time. “He begged, however, not to be misunderstood: he did not mean to say if a colleague was wrong he should, under any circumstances, be supported. 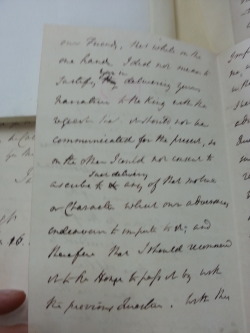 But in a ballanced [sic] case, where a colleague was merely in error, he thought by deserting his cause, he should be exposed to more merited reprobation than could otherwise fall to his share, justice, decency, and propriety alike called on them to postpone coming to a decision on the resolutions that night”. I can hardly read this letter without wincing, and I imagine John, too, had a bad moment or six when he opened Perceval’s packet to read the following. I was in expectation of seeing you to day at the Cabinet, or I should have endeavoured to pursue a meeting with you by appointment. You are aware of the Line which I took in the Ho of Co on Friday last [the debate of the 2nd, in which Perceval labelled Chatham’s early submission of his memorandum to the King an “error” and postponed the vote]; it succeeded to the extent of putting off the discussion, and gave me the opportunity of making known to our Friends, that while on the one hand I did not mean to Satisfy you in delivering your Narrative to the King with the request that it should not be communicated for the present, so on the other I could not consent to ascribe to that delivery any of that Motive or Character which our adversaries endeavour to impute to it [ie, that it was unconstitutional]; and therefore that I should recommend it to the House to pass it by with the previous Question. With this Impression known to be felt by me, we shall meet the Question in the Ho of Commons tomorrow, and I believe that this is the most advantageous manner in which this Question can be met. I wish it may succeed; but I have too much reason to fear that we shall be beat [in fact Whitbread’s motion was not passed, but only by a slim margin of 33 votes]. I have heard to day and yesterday of several who will keep away, and not suffer us. Lascelles, & the Master of the Robes are two, who think the House of Commons cannot pass over the subject by the previous Question. These are authorities of great weight. Still I feel most strongly that, if the Ho of Co should pronounce any judgment against this proceeding of yours [note: “of yours” ~ If John didn’t feel his hair standing on end at that phrase then he was excessively dim], more especially if they characterize it as unconstitutional, it will be impossible that the King’s Service can go on, particularly in our State of Weakness, with the Weight of such a vote against any one of His Servants; and therefore it is absolutely necessary to endeavour to resist it. This I shall do to the best of my power. But I should not think I acted fairly by you if I did not thus fully apprize you of the view which I take of this unfortunate Business [John’s hair, already standing on end, probably started to turn white at this point]. I cannot conclude this note without assuring you how deeply I lament all the untoward circumstances which this unfortunate narrative has brought upon us all, and more particularly upon you.